Like little Oliver Twist who was denied his second bowl of gruel in the workhouse—it seems that Charles Dickens’ public always wanted more. Happily, for many years, Dickens was willing and able to give it to them. In fact, it worked well all around. 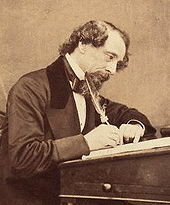 Dickens was often in need of money to support his extended family and writing prolifically to please the masses helped him care for his relatives. It’s hard to imagine any literary writer today being in a similar position. That is, able to replenish his bank account, almost at will, by turning out another popular novel, short story, or travel book. Yes, there’s Stephen King who has his literary moments and the machine that is James Patterson —who I haven’t read and have no immediate plans to, but it seems unlikely that generations of children will read these books in school or that their stories will be made and remade into amateur and professional productions the world over. Of course, not every work Dickens wrote was a masterpiece (or a gold mine) but the combined quality and quantity of his work leaves me awestruck indeed. As for the fortunate readers who can enjoy his stories in a wide range of formats, including as free ebooks—God bless us everyone. Because my Blogger following list keeps dropping you (why??? ), I missed Dickens' 200th birthday! Thanks for this. I think the closest thing we have to Dickens now, in the context of this post, is J. K. Rowling. But whether the Harry Potter series qualifies as literary is for someone else to decide. Many people think so. Too bad Dickens wasn't able to sell movie options, merchandising rights, executive producer credits, and the like. His financial troubles would have been permanently put to rest. Also, if you haven't already, you might enjoy reading the great extended essay Orwell wrote about Dickens - an excellent analysis and, because it's Orwell, a joy to read. You can find it in many Orwell essay collections, and most (possibly all) of Orwell's work is available online. I hadn't thought of J. K. Rowling. I'm glad to think, too, that there's a woman in this category! Also appreciate the Orwell tip.